The Barbados Water Authority (BWA) is being advised to take a step back, do an inspection of the recently donated tanks from corporate Barbados and admit it made a mistake. The area on this Tuff Tank to show that it was inspected is vacant. This caution comes in light of an apparent rupture of several of the 1000-gallon tanks donated for the BWA’s Rapid Response Unit Community Tank Project, and subsequent suggestion from the BWA that it was due to vandalism. However, Barbados TODAY investigations revealed that when the rapid response programme was conceptualized back in 2015, similar 1000-gallon Tuff tanks from manufacturer Rotoplastics Barbados Ltd. were used in the pilot phase and a number of them had collapsed. 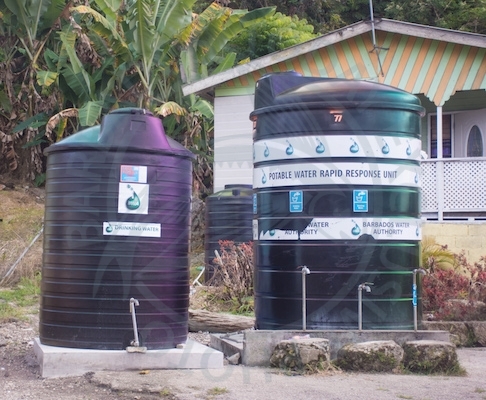 Water tanks in rural Barbados have taken the spotlight in recent months. It is understood that as part of that project, which was set up as a temporary measure to provide relief for residents who suffered from the perennial problem of water outages, several different sized tanks were tested. After the rupture, from which the manufacturer sought to distance itself, it was decided that the 2000-gallon tanks were best suited for the community project. “The integrity and suitability of these 1000 gallon tanks will have to be inspected more carefully when delivered from the manufacturer for any similar faults. This is to minimize a reoccurrence of the Boscobelle, St Peter incident and avoid any safety issues for the residents accessing these community tanks,” a caution, which was signed then by an engineer Edmund Brathwaite said. A report, which is now being circulated on social media, showed that Rotoplastics, the BWA and Innotech were made aware of the failed tanks. In addition, an email which Barbados TODAY saw, revealed that an operations manager of Rotoplastics at the time, wrote Innotech to inform that company that Rotoplastics would not accept “that our Tuff tanks are at fault and firmly believe that the damage was caused by the angle at which the tanks were leaning”. However, he said, the company was willing to replace the damaged tanks at 50 per cent off, and that this gesture would apply to any further damaged tank(s). “I also do believe that you will not have that issue again as you have begun to level the platforms on which they stand,” said the email. One source close to the developments told Barbados TODAY that all the parties involved concluded three years ago that the potential risk to the public did not warrant incorporating the 1000-gallon tanks in the project and that was when the 2000-gallon tanks were decided on although they cost “six times” more than the 1000-gallon ones. Principals of Innotech declined to comment on this issue and would only say “we do not discuss company policy”. When contacted, the Operations Manager of Rotoplastics Barbados Ltd Jackie Wilson said she was not aware that the tanks had collapsed during the 2015 pilot project. When pressed about the testing and the quality of the 1000-gallon tanks for such a project and why the company would still sell them to corporate Barbados to donate, Wilson insisted that the tanks were in no way inferior since “the material is used proportionately according to size” in the making of the tanks. “What I am prepared to say at this time is that there is a standard way of making the tanks and there is a guarantee on each tank for seven years,” she said, adding that Rotoplastics would soon be making an official statement. The 200, 450, 600, 800 and 1000-gallon tanks are manufactured in Barbados, while the 2,000-gallon tanks are manufactured in Trinidad & Tobago. “It is the same application, same process, same material used because that is how the tanks are done and each tank, whatever the size has a sticker that says seven years warranty on it,” said Wilson. The issues relating to the tanks surfaced last December after the BWA raised an alarm that Innotech had removed the community tanks. It was later found out that the company was carrying out its scheduled cleaning. However, within days corporate Barbados started donating replacement tanks. Earlier this week several of those tanks collapsed, leaving residents in sections of St Joseph and St John shocked and wondering what would happen when their taps go dry again. The BWA issued a statement saying that a full assessment would be carried out, suggesting that “there is evidence of vandalism”. “The authority will be engaging the services of the Royal Barbados Police Force to investigate the matter,” the BWA said in its statement. An engineer close to the developments told Barbados TODAY he believed the tanks collapsed simply because the base were not properly done. “The BWA would be well-advised to pause, to take stock, to inspect the tanks to see that what they have that were donated were properly manufactured and properly signed off by the manufacturer as having been inspected as properly manufactured and certified,” he said. “They would be well-advised to look at the base of the concrete tanks because they have altered the base of the concrete tanks especially as it relates to size. They have issues where the base is smaller than the tank itself. That is not permissible from an engineering perspective, neither is it recommended by the manufacturer. “The BWA would be well-advised to pause, to take whatever public embarrassment they think they are going to suffer, rather than risk their integrity or the safety of the general public,” he added. He said it would also be in the best interest of the utility company to ensure the underlying structure of the base was well compacted and secured since this was found to be the fault three years ago when the tanks first collapsed. One source told Barbados TODAY although he did not carry out an assessment himself, it was possible the water tanks could have exploded because of how they were positioned. Describing the development as “grossly unfortunate”, the source even questioned the quality of the tanks, saying during the pilot project concerns were also raised about the thickness of those tanks. He said while the help from corporate Barbados was admirable, he believed the water company was trying to replace the tanks “quickly and cheaply” instead of correctly. “The tanks cannot be inclined,” he said, explaining that unless the base was properly compacted and level then it would present some problems. “Unless the tanks have been properly inspected to be absolutely certain that they meet the specification of the manufacturer locally, then there is a possibility that is a contributing factor,” said the source. “If the BWA or whoever else installed those tanks did not carry out a proper inspection of an installation of the tanks’ base and sub-base especially as it relates to it being level and properly compacted, then you can almost certainly sit back and expect that there will be more ruptures across Barbados,” he added. I initially thought it was vandalism but now that new info has come to light, that appears less likely. Now I know where not to get my water tanks from when I come home. Shocking. Well u cannot take a chance and buy tanks from that company anymore . Who was it that talked about ‘squared pegs in round holes’ during the recent election campaign? These days it seems its difficult to find any pegs to fit at all. Pegs are not manufactured by public relation professionals sadly. I thought that 2 was a couple, not several. If the concrete base is not even, the weight of the water will cause it to collapse. As I said before, it would be better served if some smaller ones are donated to each household. I have had a tank for almost 2 decades and it is still standing. It looks like someone has a concrete prop, with a space underneath, in the one in the photograph. Poorly managed entity with two TRICKYDADIANS at the head. Can’t the Gov’t find two qualified Barbadians to run this entity? I have installed hundreds of these tuff tanks over the years all over Barbados as storage of water for many customers. I have had some that leaked, but I have never had one that collapse. The fist time I saw a collapse tuff tank was in 2017, when I worked for Water Management Caribbean and was stationed at the old Andrews sugar factory, were the 2000 and 1000 gallons water tanks were stored and the preparations made to have them used as community tanks. Some of these tanks collapse during the cleaning and sanitizing process. The quality of these tanks seems to be poor and operating these tanks in the hot sun not only show up the poor quality materials used, but it also contaminates the water while the material breaks down. When you have black plastic tanks in the hot sun the materials become soft and collapse. My suggestion is to only use Fiberglass tanks and that collapse problem would go away and the water inside these tanks would not be contaminated. The only sabotage is BWA board sabotaging the company and people. I told ya!…… Every time something goes wrong or don’t work out in this administration it is called sabotage. Always the blame game. Again no one is taking heed of Lt Col Browne’s advice of utilising a professional engineer in such matters.